The Shrine of Juan Luna is located in the town of Badoc in Ilocos Norte. This is a two-storey building made of brick which was reconstructed in 1977 by the National Historical Institute. This house is the birthplace of two brother heroes Juan Luna and General Antonio Luna. 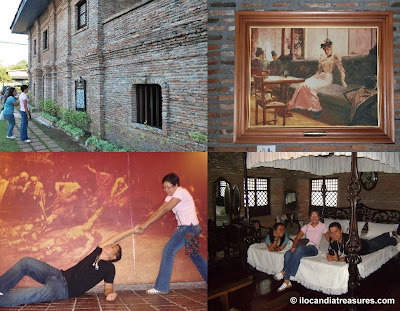 This Luna House contains the reproductions of the masterpieces created by Juan Luna himself. The Spoliarium is his greatest work followed by the Blood Compact, La Battala de Lepanto, People and Kings and Parisian Life and many other notable works. The original artworks were placed in the museum in Manila. The Parisian Life became controversial a few years ago because it was bought by the Government Insurance System at a huge amount of money. After attending the feast of La Virgen Milagrosa de Badoc, I, with Fanny and Mai dropped by to see this historic home of the great Filipino painter Juan Luna. The staff members were so accommodating that they even extended their time to entertain us. They showed us every corner of the house. We were even allowed to lie down on the bed of Juan Luna. Juan Luna was born in this reconstructed house on October 24, 1857 however the original house was burned down in 1861. He was the son of Joaquin Luna and Laureana Vovicio. He was instrumental in placing the Philippine art and culture on the world map. He established his reputation as a master painter in the country and in Europe for his major awards. He won a gold medal for his masterpiece “Spoliarium” at the Madrid’s National Exposition of Fine Arts in 1884. Luna died in Hong Kong in 1899 and his remains were interred at San Agustin Church, Intramuros, Manila.